Rediff.com » Movies » Readers Quiz: What was Gabbar's father's name? Readers Quiz: What was Gabbar's father's name? We had asked readers to make their own quizzes right here on rediff, and we got quite a response. Readers sent in some brilliant questions, and interesting trivia. 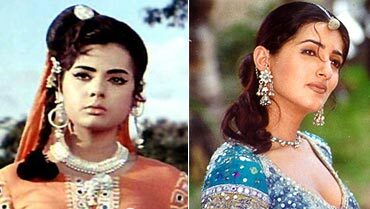 Here's presenting the first Rediff Reader Bollywood Quiz, in this special series. So go ahead, test your filmi knowledge. 1. R D Burman first played the mouth organ for which song? The correct answer is c. Rediff reader Arnab Sen's father apparently studied in the same school in Kolkata as R D Burman. Once after the Durga puja vacations, Burman came back from Mumbai and told his friends that he had played the mouth organ in one of his dad's films, which was this famous chartbuster. Correct! Rediff reader Arnab Sen's father apparently studied in the same school in Kolkata as R D Burman. Once after the Durga puja vacations, Burman came back from Mumbai and told his friends that he had played the mouth organ in one of his dad's films, which was this famous chartbuster. 2. 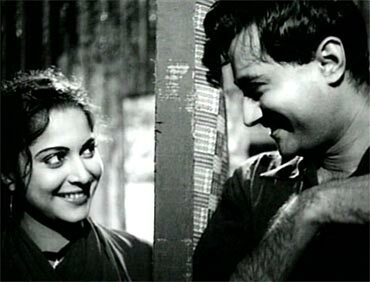 The film Mela -- both old and new -- had two Khan brothers working in it. Name the brothers. The correct answer is b. It was quite a coincidence, that two films with the same name starred two pairs of Khan brothers. Correct! It was quite a coincidence, that two films with the same name starred two pairs of Khan brothers. 3. 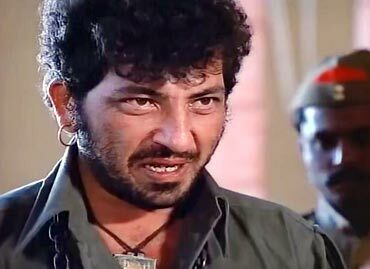 What was Gabbar Singh's father's name in Sholay? The correct answer is b. When Gabbar Singh was brought to court, his father's name was called out: Gabbar Singh Vald Hari Singh. Correct! When Gabbar Singh was brought to court, his father's name was called out: Gabbar Singh Vald Hari Singh. 4. Which actor has received the maximum number of Filmfare awards? a. Dilip Kumar, Shah Rukh Khan and Amitabh Bachchan received eight awards each. b. Rajendra Kumar, Mithun Chakraborty and Saif Ali Khan received nine awards each. c. Dev Anand, Rajesh Khanna and Akshay Kumar received 10 each. The correct answer is a. Out of his eight, Amitabh Bachchan bagged three awards for actor in a supporting role whereas Dilip Kumar and SRK bagged all eight awards in Best Actor category. The most awards received by any film personality is A R Rahman and Jaikishan -- at nine each -- for Best Music. Correct! Out of his eight, Amitabh Bachchan bagged three awards for actor in a supporting role whereas Dilip Kumar and SRK bagged all eight awards in Best Actor category. 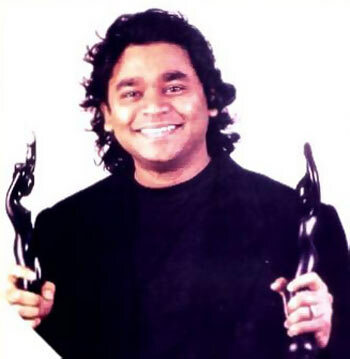 The most awards received by any film personality is A R Rahman and Jaikishan -- at nine each -- for Best Music. 5. We all know Jackie Shroff played an Air Force Commander in Border. But in reality, he had swapped his role with one of the main stars from the film. Who was it? 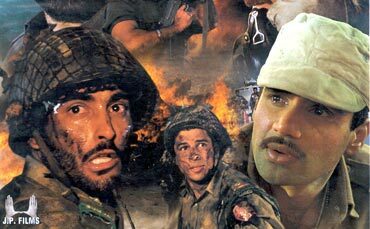 The correct answer is b. Jackie Shroff was offered the role of Captain Bhairav Singh, which was eventually played by Suniel Shetty. Jackie claimed he rejected Suniel Shetty's role because he was not comfortable shooting for long hours in the desert sand. Correct! Jackie Shroff was offered the role of Captain Bhairav Singh, which was eventually played by Suniel Shetty. Jackie claimed he rejected Suniel Shetty's role because he was not comfortable shooting for long hours in the desert sand. Make your own Bollywood quiz on rediff! Quiz: Know these famous movie scenes?